mine for today is watching the kids over the back jumping on their trampoline and crashing into each other laughing their little heads off while i done the dishes..
Last edited by Brettus; 29-11-14 at 04:26 PM. Helping my 4 year old nephew earnestly write his letter to Father Christmas. He used his best handwriting, added lots of kisses and drew a picture of a dinosaur then asked me to post it. Of course Father Christmas will reply as I've done one of these for him, they are brilliant, and my £5 donation helps a child too. This turned up in my FB feed yesterday. 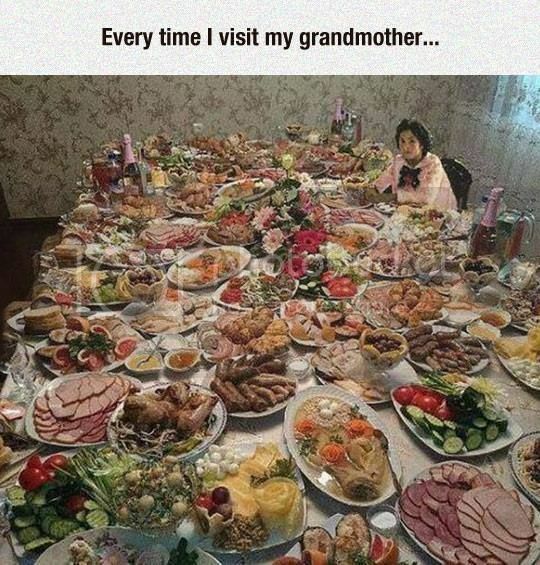 It made me laugh because when we were kids, this is actually what my grandmothers table used to look like after Xmas when she had a big house. Her birthday was on that day, and all the family used to squash in happily. It also reminded me of the newly discovered long lost Greek family, who welcomed their cousin back to Cyprus last month. . . . . this is a USUAL family LUNCH!!!! We ate like this EVERY day!!! Looking out of my front window to see 20+ sheep giving the lawn a bit of a trim. Rang the local farmer and told him not to rush, I'd been trying to decide if I should get the mower out one last time....! Wales win over South Africa today!!!! Having the house to myself for a few hours. No urgent chores or DIY to do this weekend, the monkey was at her Saturday job, Lady Poppy was Christmas shopping with her sister for the day plus I could not be bothered to get the bike out as the roads were soaking wet and slippery with leaves and diesel as I found when cycling into town to drop off my dry cleaning. So I made a nest from cushions and a duvet on the sofa and watched a few episodes of Fast'n'Loud off the planner without being disturbed for once, while drinking tea and making a fuss of the dog. Nice. Now the house is full again and I've escaped upstairs to the study as the girls are watching I Used to be an Alleged Celebrity. I know Foggy is in it but I really don't want to spoil my nice day with the rest of the no-hopers. Playing music with my girls at the Whitchurch Christmas lights fair all day today. Never fails.